Panada Apartment is a huge, cozy home for even 10 people. Its central location provides the best starting point to discover the city. Two bedrooms, a large living room, a dining area, a fully equipped kitchen, and bathroom with shower wait for the guests. 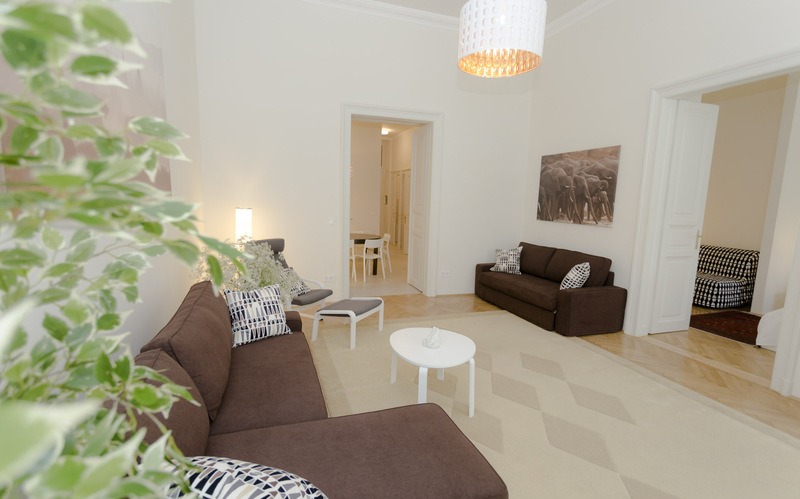 This apartment is a spacious, bourgeois flat with two separate bedrooms and a huge living room. The three airy rooms are comfy to accommodate ten people! The well-equipped kitchen, dining area and the bathroom with shower ensure your pleasant stay. Free WiFi connection and TV are at your service. Welcome to the neighborhood of the best restaurants (Michelin-starred Costes! ), bars and galleries of Budapest. The Central Market Hall, the Hungarian National Museum, the Museum of Applied Arts, and the Corvinus University are within walking distances. Or cross Petőfi Bridge to find A38 Ship on the Buda side, which became the best bar in Lonely Planet’s 2012 vote! Within 5 minutes walk, you can reach Corvin Quarter, from where you can map the whole capital by metro, bus or tram. Castle Hill and Városliget are less than 30 minutes away.